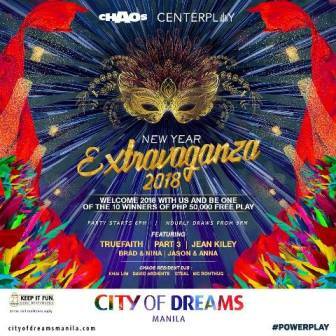 Ring in the New Year with an extravaganza like no other at Chaos Manila! Welcome 2018 with bands like Jason & Anna and Brad & Nina, and Chaos resident DJs Steal, David Ardiente, Khai Lim, and MC Ronthug! Party starts at 11 p.m. Chaos is at Asean Avenue corner Roxas Boulevard, Entertainment City, Barangay Tambo, Parañaque City. For inquiries & table reservations, call 0917-886-3678, e-mail ChaosTableReservations@cod-manila.com, or log on to their website.